Herbivores visiting Kampot will find it a food-lover’s paradise. The sleepy city by the river embraces the veggie lifestyle with three vegetarian-only restaurants and most eateries offering enticing plant-based options. Vegans need not fear; Kampot has you covered too with plenty of purely plant dishes that let you enjoy your stay without worry. 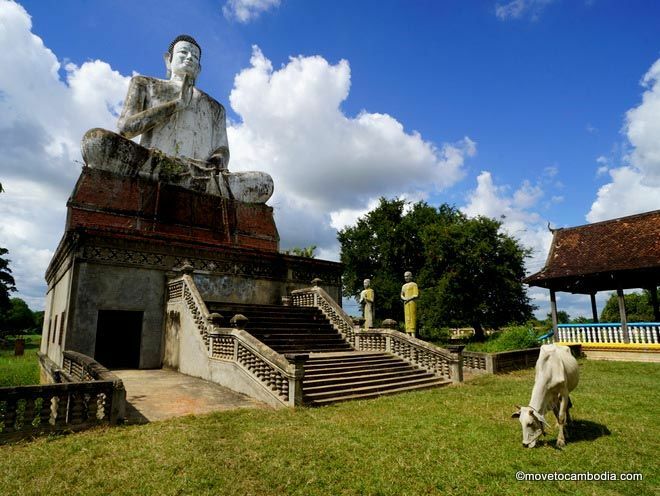 The following are my tips for the best vegetarian and vegan restaurants in Kampot. 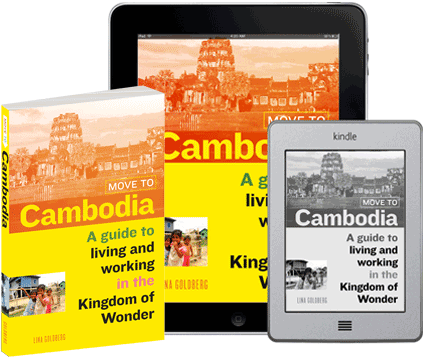 In addition, you can find general tips and menu cards in our all-Cambodia guide to eating vegetarian and vegan. Vegetarians and vegans visiting Kampot have nothing to fear when it comes to dining. One of the newest vegetarian restaurants in Kampot, Eco Vegetarian prepares a different special every day of the week alongside their limited daily menu. Fewer options means that each dish receives extra love and attention with no MSG or palm oil. The simple but flavorful daily offerings include a warm yellow dal, tofu or egg masala, a bread omelette, and provincial mushrooms with cashews. Eco Vegetarian’s daily specials encompass the best of vegetarian food from around the world. Sample something French, Indian, or Lebanese depending on what day of the week you drop by. One of my personal favorites is the veggie korma on Thursdays with tons of veg and cashews in a spicy curry gravy. (Another win for the cashew-obsessed.) Cheese-loving vegetarians should stop in Saturdays for the tartiflette with real French Reblochon cheese. For a list of specials, check out their Facebook page. The raw spaghetti at Deva Cafe is divine. 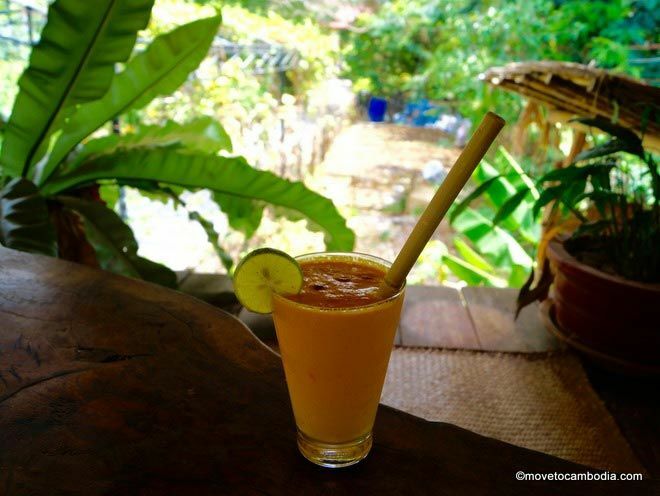 Deva Café is a little ways outside the Kampot city center at the entrance of Banteay Srey Spa. The café and spa are both social businesses run by the Banteay Srey Project, working to provide a safe space for Khmer women escaping from difficult or dangerous situations. When you purchase something from Deva Café, you help fund the housing and education of the strong women working and living at Banteay Srey. Luckily, the food and drinks offered by Deva Café taste great even without the added benefit of supporting a good cause. The Mediterranean-influenced menu includes vegetarian and vegan tapas made with ingredients grown in the organic vegetable garden at Banteay Srey or at local farms. 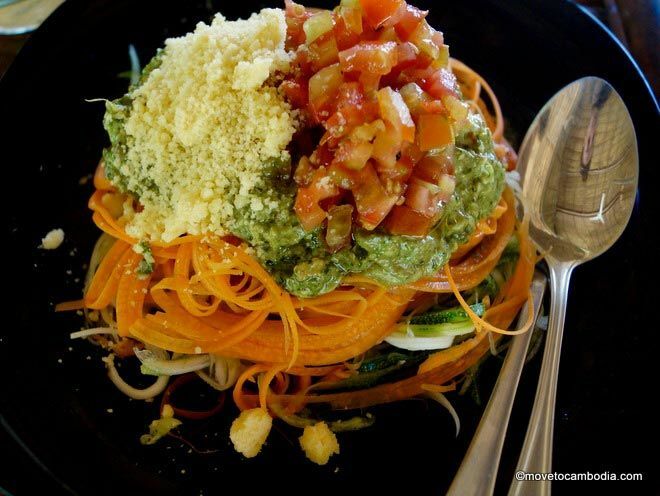 The massive raw spaghetti with avocado pesto is only $3 and could feed a small, vegan army. Deva Café also possesses an extensive smoothie and juice menu with delectable treats for $3 or less, like the ‘power monkey’ or the carrot cake smoothie more cashews!). Indulge in dessert without undoing all that healthy eating by choosing one of their homemade vegan chocolate truffles. Double down on being healthy with a vegetarian meal and a yoga class at Simple Things. Probably one of the most well-known vegetarian places in Kampot, Simple Things sits in the middle of the city’s downtown area just east of the Old Market. The Russian-owned vegetarian mecca also offers a humongous menu of strictly vegetarian meals and more than 30 vegan dishes. Vegetarian and vegan visitors will be excited to find the largest variety of plant-based protein sources in Kampot, including bulgur, tempeh, chickpeas, and lentils. Ask any local what to get from Simple Things and the majority will respond, “pizza!” without hesitation. A thin crispy crust serves as the base for several tasty pies like the ‘mushroom lovers’ or the ‘broccoli heaven.’ Vegans with a sweet tooth will rejoice once they see the many non-dairy desserts offered, including the creamy raw mango cheesecake. Looking to burn off some energy after all that healthy food? Simple Things also offers daily yoga classes — Hatha in the morning at 9 a.m. and Vinyasa in the evening at 5 p.m. Check their website to confirm the dates and times for the current week. Open Thursday to Tuesday, 9 a.m. til 2:30 p.m. and 5 until 9 p.m.
Open Wednesday to Monday, 8:30 a.m. til 6:30 p.m.
Open Monday to Saturday, 6 til 9 p.m. 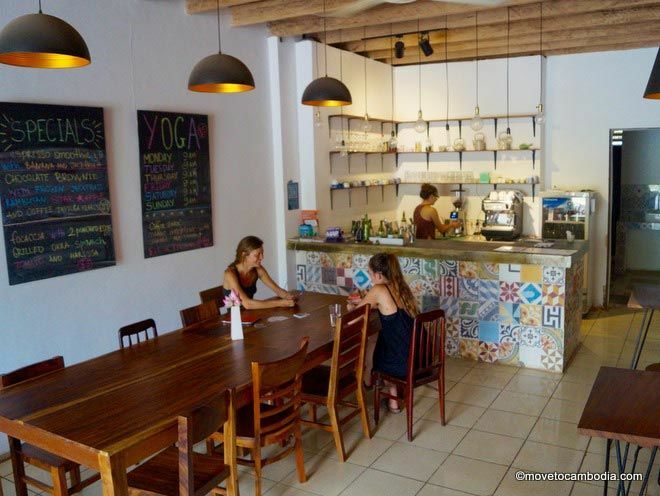 This entry was posted in Kampot, Food and tagged Vegetarian, vegan and vegetarian, Simple Things, Deva Cafe, Eco Vegetarian. Bookmark the permalink. Of all the vego joints in all the world, Simple Things may be one of the biggest and best surprises! Thank you so much for writing about Simple Things! ?